Riding on the heels of last year’s success, Vivid Lights Sydney will be back with a bang in 2019, illuminating the city with its brilliance from 24th May to 15th June. Last year, celebrating its 10th anniversary, Vivid 2018 catapulted itself into one of Australia’s largest events ever! The organizers had taken special care in making the event a special experience for all visitors and will continue the same this year as well. 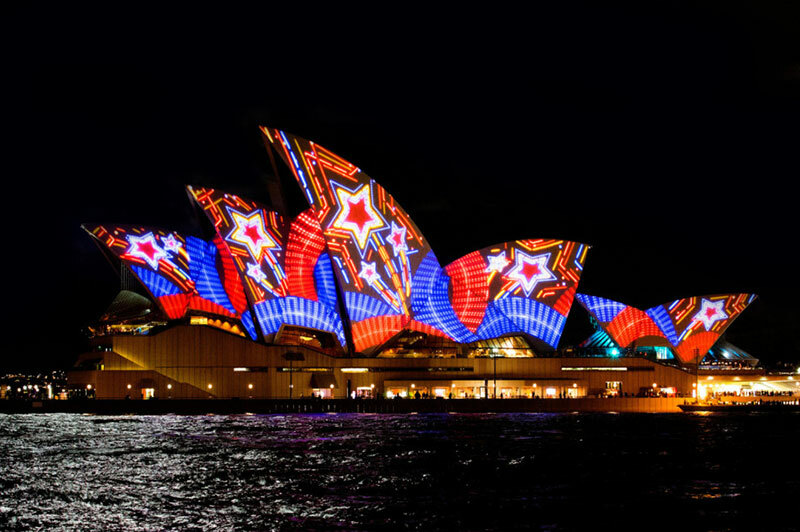 The highlight of last year’s Vivid Sydney was “Metamathemagical”, a dynamic show by Jonathan Zawada, of morphing digital sculptures on Sydney Opera House’s exteriors. This year all of the attractions are to return for an even better show! It is not just restricted to Lights either! The Sounds and Ideas segment of the event have grown to become as popular as the visually captivating Lights segment itself! While Lights is about astonishing light installations and overwhelming projections that come alive every day in a luminous blues, pinks and anout-and-out rainbow of many more colours from 6:00PM – 11:00PM. 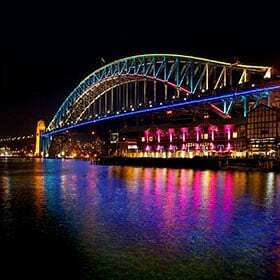 Right from famous spots in the city like Circular Quay, Barangaroo and Darling Harbour to Kings Cross, The Rocks, Botanical Gardens, Taronga Zoo and Chatswood; every prominent place is illuminated throughout the season. Coming to the Music segment, artists from all over the country and also the world will gather in Sydney, converting everything from the small bars to the grand Opera House in to platforms of live performances that will entice your auditory senses. Last but not the least comes Ideas. Let it be learning, exploring or networking innovative or new concepts, ideas or any kind of creativity, Ideas covers it all. Right from event workshops, discussions, classes, fests and gatheringsthat take place all around the city every sector of the creative industry right from film, architecture, technology and culture finds an audience here. 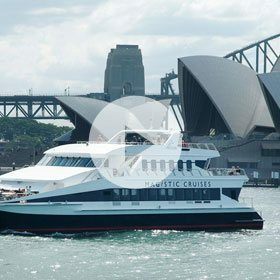 Three delightful Vivid Sydneydinner cruise packages are provided by Magistic that offer to suit every budget. 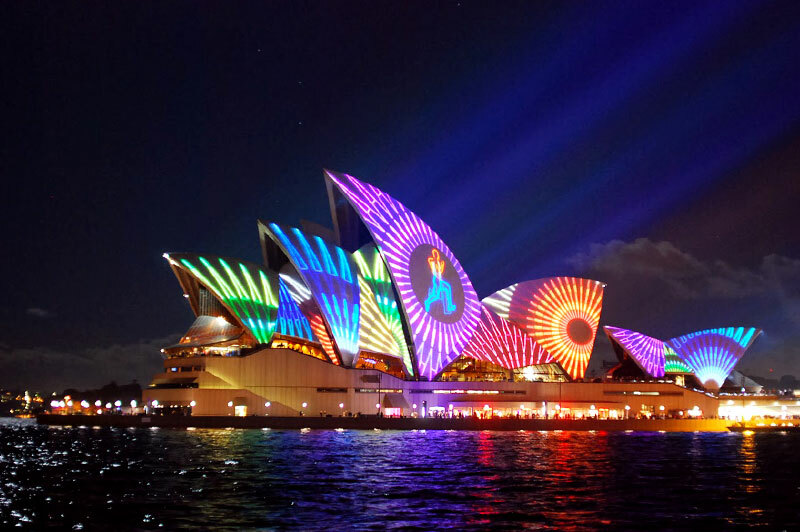 Both packages treat you to an authentic Vivid Sydney experience, differing only in price, inclusions, cruise duration and days of operation. Enjoy a delicious freshly prepared buffet dinner while you revel in stunning views of the Opera House, Harbour Bridge and Harbour lights parade without getting involved in the hassles of crowded city roads. You can choose from the 2-hour or 3-hour option depending on whether you want to go for a weekday cruise or a weekend cruise. Also, for a more private experience, choose to go on board the private top deck of a luxury catamaran. All of the above packages also include a selection of drinks. Choose from beers, wines or soft drinks and make the most of your evening. With the wide outer decks on board the vessel, you can enjoy roving views of all lights right from the comfort of your catamaran. With reserved seating and waiter service, there’s nothing about these packages that you’ll not love! 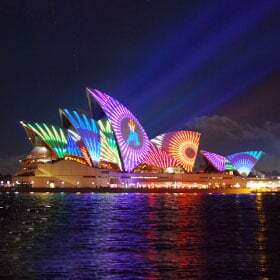 So, if you're visiting Sydney between May and June, be sure to hop on a Magistic Vivid Sydney Cruise to enjoy Vivid 2019 to the maximum! 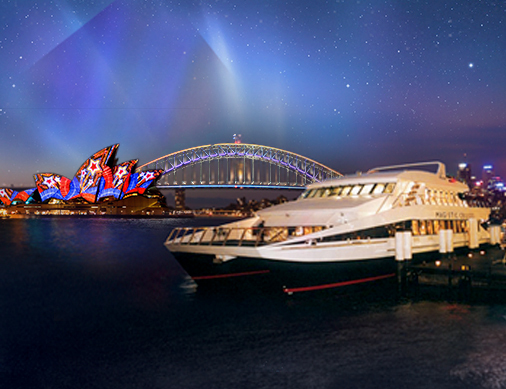 Choose the Vivid cruise package that suits you best and experience Vivid Sydney at its best! 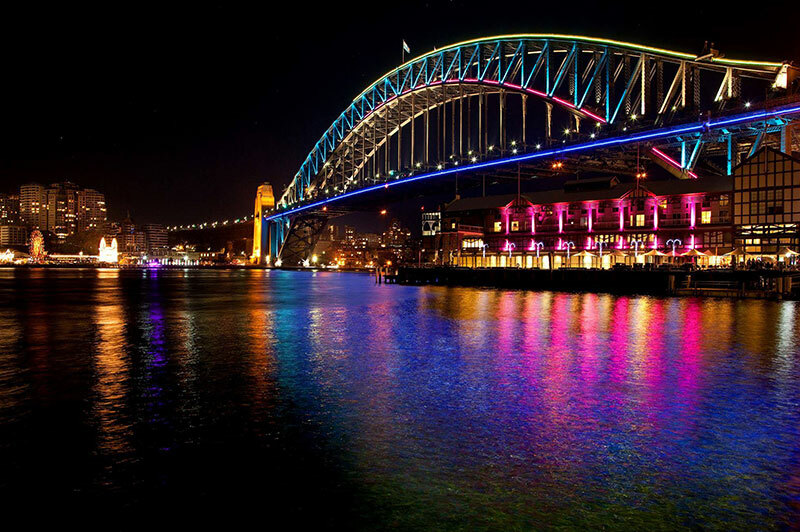 Experience the magic of the Vivid Sydney Light displays, from the heart of the Sydney Harbour, for a memorable evening! 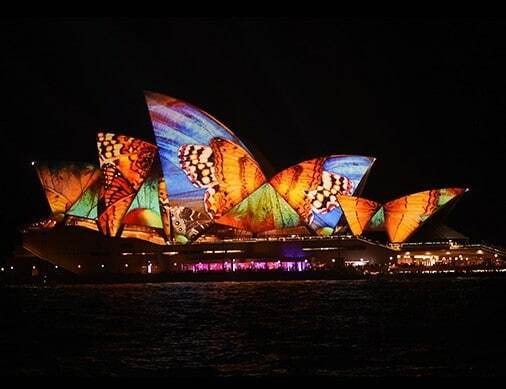 The Vivid Sydney Festival is a spectacular annual cultural event that will rock Sydney. 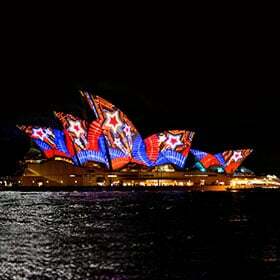 Experience VIVID’s breathtaking light displays that transform Sydney Harbour into canvas of creativity. The dazzling Light Walk was extended this year to Luna Park, and it came to life with a large scale projection on the façade of Coney Island. Celebrating the history, creativity, engineering, magic and fantasy that have come together to create special memories on this site. 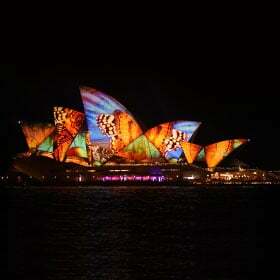 The Royal Botanic Garden was also illuminated this year, along with a stunning display at Sydney Opera House. 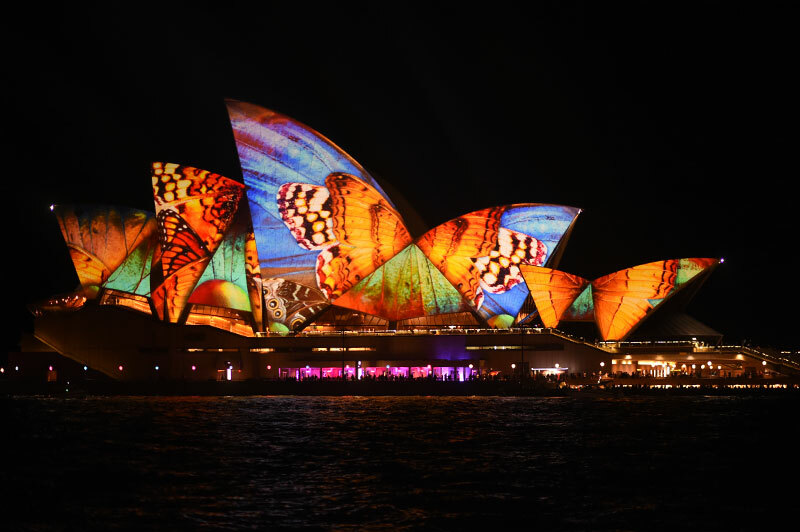 The Lighting of the Sails was created by award-winning Australian artist Jonathan Zawada. Visitors were captivated by a dynamic display of morphing digital sculptures. Titled Metamathemagical, this bold display was inspired by recognizable Australian motifs across science, nature and culture. Popular precincts Taronga Zoo, Darling Harbour, Chatswood, Kings cross, and Barangaroo returned this year stunning viewers with their awe-inspiring displays. With an impressive line ranging from jazz to sonic experimentation, the Vivid Music scene upped the ante this year. A performance by Grammy winning St. Vincent, and the return of Curve Ball were the centres of attraction this year. Other events such as Innovators in Jazz, Vivid Live and X|Celerate accounted for essential attractions this year. Major artists that turned heads this year included, Kurt Ellis, Mazzy Star, West Coast Rapper Ice Cube, and Grammy winning artists Brandford Marsails, and Solange. 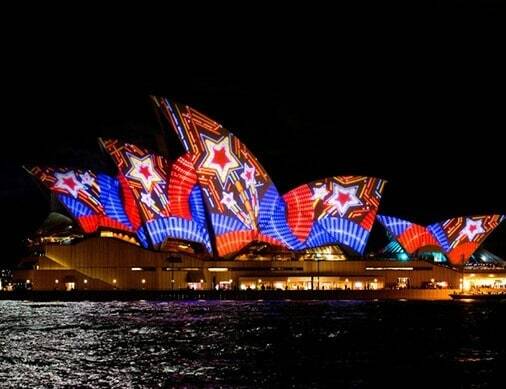 On the emerging local talent side, Vivid Sydney and the City of Sydney came together to liven up music venues across town. Providing a forum to workshop, collaborate and cultivate fresh thinking across tech, design, entertainment and culture, Vivid ideas aim at creating catalysts for the architects of the future. Some of the world’s greatest minds presented during Vivid Ideas 2018, exploring the future-shaping scenarios that will define our everyday lives. Dare Jennings, an Australian global success story, Futurist and game developer Jane McGonigal, visual strategist at NASA’s laboratory Dan Goods, and film maker, marine explorer and conservationist James Cameron were included in the roster this year, and explored topics such as Evolving democracy, future of work, Blockchain Decoded, and ethics of humanising technology.